Luton and Bedfordshire adult mental health wards were the last to trial the Trust’s violence reduction package, spread from Tower Hamlets ward-by-ward across the Trust. Their aim was to reduce physical violence on inpatient wards by 30% by September 2018. Between July and September 2018, progress rapidly improved. Wards started holding regular safety huddles and completing data recording more reliably, yet not reliable enough to be confident of quantitative improvements. What was clear was that the whole MDT were starting to huddle, wards were sharing learning with each other, service users were becoming increasingly involved and staff were seeking out best practice activities and improving ward environments. The wards describe how they came to feel really different. Wards felt calmer and less reactive. Moreover, there were unexpected benefits from the time and energy that has been released, including more time with service users, reduced length of stay and lower staff sickness. The violence reduction work has now ramped up, with half the wards now huddling over 18 times per week, more active experimentation and new insights. This month we are going to reflect on how it all started in Luton and Bedfordshire, the challenges they faced and overcame, the new things they’ve tried and what next. 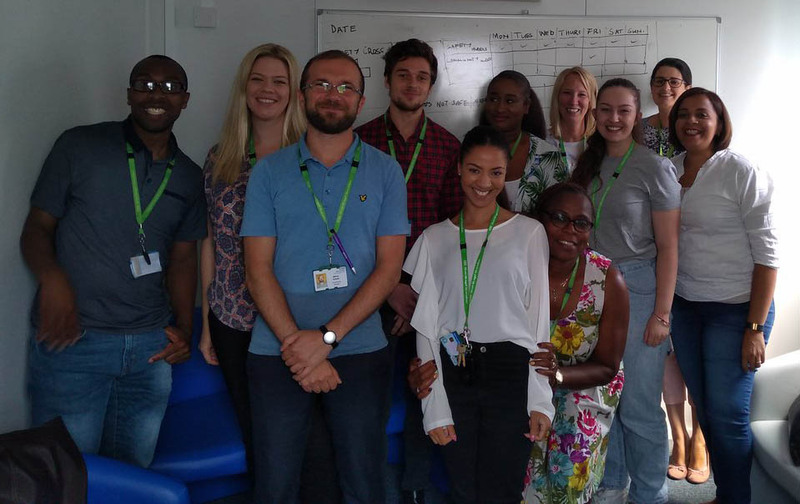 In December 2017, seven adult mental health wards across Luton and Bedfordshire joined a collaborative to be a part of the Trust’s violence reduction work. Collectively they were experiencing an average of 51 physically violent incidents per month. Each incident was affecting the victims and witnesses and the ward’s morale, whether the incident had been spitting on a staff member as they re-enter the room or fracturing a service user’s jaw so they need four hours of surgery. In December 2017, the wards began to trial the safety package (namely the safety cross, daily safety huddles, Broset Violence Checklist and safety discussions in weekly community meetings). In the first six months, the work existed but was struggling to create momentum. Then Borough Lead Nurses and ward leaders gave the work a fresh push, starting fortnightly breakfast meetings for all ward MDTs. The Forensics directorate kicked off the first breakfast by sharing experiences of their journey, followed by an open conversation. Then each ward was scheduled to present at each upcoming breakfast. Through these meetings, the challenges started to be vocalised and wards also committed to what they would try. These commitments included understanding how violence makes people feel, having set times for safety huddles, wider MDT engagement and including service users in the process. “We have a very volatile person on the ward. Historically if something happened we would respond, restrain and take him to seclusion. But the safety package has really impacted how we now approach things. In this case, the staff called a huddle and agreed ‘If this happens, the first step is to have 1:1 talk with him. If that fails, we’ll offer him PRN. Next step is we take him off the ward to the quiet room for a 1:1 with the MDT around. Failing that, if violence increases, we’ll look at seclusion’. The staff followed the plan and were able to deescalate the situation at step three, before it got to seclusion. As a result, no one got hurt, no hands were laid on anyone. It is a really good example of what can be achieved as a result of this work”. The frequency of huddles increased dramatically. They went from being held only a few times a week (when Gareth describes “staff didn’t really understand why they were valuable”) up to a consistent two or three times a day across many of the wards (at least two a day and in some cases one at night). For example, Ash, Onyx, Crystal, Willow and Jade Wards have recently achieved 19-21 huddles per a week; two in the day and one at night seven days a week. Bedfordshire wards led the trust in utilising visual management boards specifically to quality control the outcome measure and safety change bundle processes. Willow ward helped other wards in the trust to create their boards, through sharing their whiteboard template. “In huddles you’re assigning specific tasks to individuals. So it is great to have the doctors in that meeting, for example, because then they will act immediately”. What has been the impact and how does it feel? Reliability of data recording still needs to improve to have confidence that there has really been quantitative improvement. However, the staff have experienced a meaningful improved experience on the wards. “Once the momentum starts going and you start seeing the benefits, it changes everything. I don’t think there is anyone who openly says this is rubbish or doesn’t want to be part of it”. “Staff went from saying ‘another unnecessary meeting’, ‘this will never work’ and ‘too much paperwork’ to ‘it was easy to introduce’, ‘we can see a reduction in incidents’, ‘the paperwork is not that much’ and ‘doctors are coming to the huddles’”. “When I started at ELFT, I tried to keep aloof of QI. But through this work I now see why people get passionate about it because you enjoy working again all of a sudden and are not dreading coming into work”. Introducing t-shirts saying ‘Go Green for December’. We will continue to further work with service users in partnership to understand and reduce violence together. Staff have made great progress with recording data reliably, with reliability growing across the wards. The next step is to support staff to more frequently use of data as part of decision making, for example by building training into Away Days, and to clarify the quantitative impact of the work. The wards are continuing to experiment to reduce violence further. For example, work will continue to reduce restrictive practices including improving de-escalation to avoid chemical and physical restraints. A new project on improving the reporting of violent incidents to the police aims to ensure violence on wards is treated equally as violence everywhere. Another project is looking to increase carer involvement on the wards. The wards have a better handle on how to work together to make a safer therapeutic and work environment. It is really exciting seeing all the work they have done together and what they have achieved.